Jakarta (AFP) – A string of fatal accidents is threatening to derail Indonesia’s relentless infrastructure drive ahead of the Asian Games, a push seen as a key to revving up growth in Southeast Asia’s biggest economy. President Joko Widodo — who is counting on the construction advance for his 2019 re-election bid — temporarily halted all elevated transportation projects, after a dozen major accidents killed five and injured dozens more in recent months. The stoppages include construction of Indonesia’s first light rapid transit (LRT) and parts of a mass rapid transit system. The LRT in Palembang — which is co-hosting the Games with Jakarta — is supposed to be operating by August when millions of visitors are expected to arrive for Asia’s premier multi-sport event, amid concerns that not all venues will be completed in time. Widodo halted work shortly after a high-profile accident on an elevated toll road project in Jakarta left seven workers severely injured last month. The stoppage also comes after a balcony collapse at the Jakarta Stock Exchange building this year resurrected concerns about lax construction standards. “Public trust has significantly dropped — this is a crisis, a work safety emergency,” said Alvin Lie, a member of Indonesia’s National Ombudsman. Endemic corruption, red tape, and mismanagement have left many projects mothballed or neglected for years. But the president has made infrastructure development the centrepiece of his economic growth strategy for the vast archipelago nation. Widodo sees the building drive as essential to improving logistics and modernising infrastructure — and reaching his goal of seven percent annual growth, up from around five percent now. He regularly visits regions with projects underway, sometimes unannounced, in a not-so-subtle hint that building must stay on track for Indonesia to be a global player. “If we want to win the competition with other countries, infrastructure is what we need to do first,” Widodo said. A furniture seller-turned-politician, Widodo has ordered the completion of 1,000 kilometres (600 miles) of new toll roads, 3,200 kilometres of railway track, 15 new airports, two dozen seaports, 33 new dams and power plants capable of producing some 35,000 megawatts of power — enough to supply electricity to about five million people — by 2019. His plans have won applause. But there are now serious concerns that the speed and scope of some projects is leading builders to cut corners on safety, experts said. Some contractors feel under pressure to hire partner firms with little or no experience in major construction and building design to meet tight deadlines. “We have never seen Indonesia building on this kind of massive scale,” said Mushanif Mukti, a senior official at the Association of Construction Safety and Health Experts. There are few reliable statistics to compare the current death-and-injury rate to previous years, and deadly workplace accidents are not uncommon in Indonesia. But the government has now ordered that scores of major projects be re-evaluated in the wake of the accidents — a daunting task. 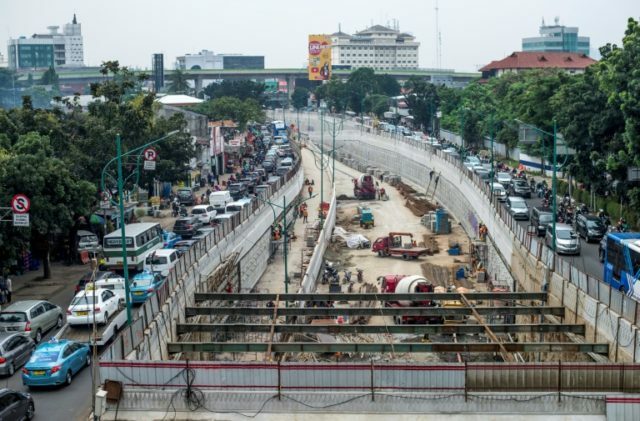 Last year alone, some 245 projects worth 4.2 trillion rupiah ($305 billion) were on the government’s priority list, including work on a Jakarta highway that resumed several years ago after 20-year hiatus. “Some of (these projects) might need to be dropped,” warned Wahyu Utomo, head of the Committee for Acceleration of Priority Infrastructure Delivery. Most recent accidents were due to ill-advised shortcuts and employee fatigue, said Syarif Burhanuddin, chairman of the government-backed Construction Safety Committee. “You might want to cut building times but you should never cut procedures,” he added. National newspaper Kompas has quoted workers on the elevated road disaster as saying they worked 10 or more hours a day, and were often called upon to do overtime. Still, Public Works Minister Basuki Hadimuljono said fast building schedules should not take the blame. “Indonesia’s acceleration is nothing compared to Malaysia and China,” he said. The fate of Widodo’s infrastructure push — and the Games’ success — is crucial to the 2019 presidential race. “Widodo will surely use infrastructure success stories and compare his performance to that of his predecessor in the re-election campaign,” said Arya Fernandes, a Jakarta-based analyst at the Centre for Strategic and International Studies. But Widodo’s political ambitions are not top priority for commuters like Mardongan Harahap, who makes the daily drive from Jakarta’s suburbs to his downtown office. “I feel very uncomfortable every time I’m stuck in traffic near building projects and worry that an accident could happen,” he said.